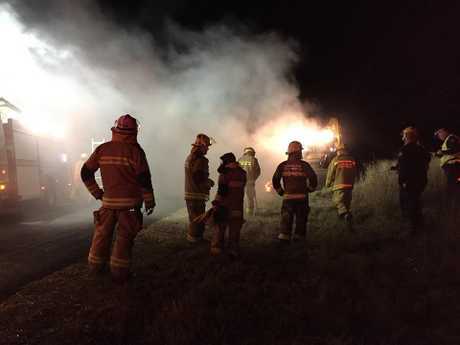 UPDATE 6.30am: Fire crews worked to clear a burnt truck on the Cunningham Highway until about 9.30pm last night. Hay inside the truck caught alight just before 6pm, with fire crews rushing to the scene about 6km east of Warwick. Police were on scene directing traffic as thick smoke covered the busy highway. UPDATE 8.15pm: Police are directing traffic on the Cunningham Highway after a truck caught fire outside Warwick. Crews remain on the scene clearing the debris after hay caught alight in the truck about 5.50pm. Cars are being slowly guided through the scene as thick smoke blankets the busy highway, about 6km east of Warwick near the Caltex service station. UPDATE 6.45pm: Fire crews are still on scene on the Cunningham Highway where a truck carrying hay has caught on fire. Crews rushed to the scene about 5.50pm tonight, near the Caltex service station outside Warwick. A spokeswoman from Queensland Fire and Emergency Services said hay in the truck had caught on fire and crews were still working to put out the flames. No one sustained any injuries in the incident. INITIAL 6.10pm: Two fire crews are racing out of Warwick to a truck that has caught fire on the Cunningham Highway. A spokeswoman from Queensland Fire and Emergency Services said hay in the truck had caught on fire. Firefighters were called to the scene, near the Caltex service station outside Warwick, about 5.50pm.